If you've been following my journal entries you may remember that my car sat unused for decades until I bought it. With relatively minimal work I was able to get the car running and usable for some short trips. During this time, however, I noticed that my engine produced a tremendous amount of white smoke from the exhaust and crankcase breather tube. I seemed to have plenty of power and at first I hoped that this white smoke was simply a result of sitting around. I thought perhaps the problem could be stuck piston rings and hoped that by simply running the engine things would work themselves out. But by the time I decided to take my car out of service for restoration the white smoke was still an issue. Being an optimist, I thought I could pull the engine and just replace the piston rings. As you will see in the next few journal entries, reality would soon set in and I would realize my engine was more tired than I initially thought. 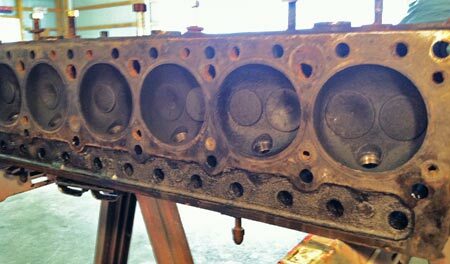 Cylinder head removed & waiting for inspection. 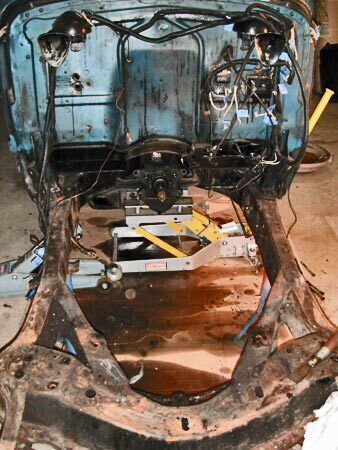 When I removed my 1937 Buick's front suspension I removed the car's entire front clip. This allowed unobstructed access to the suspension parts and also created clear access for engine removal. My first step in the engine removal process was research. I searched through old issues of the Torque Tube magazine, various discussion forums, and the 1937 Buick Shop Manual. 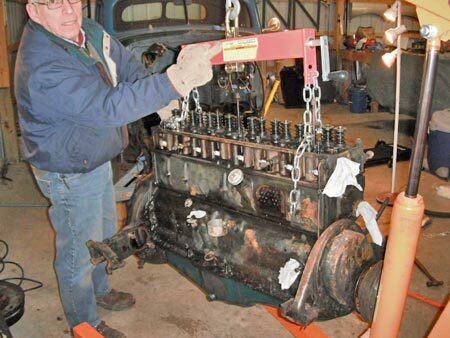 My biggest concern was that the fully assembled Buick straight-eight engine is heavy. More appropriately it is VERY heavy, closing in on 1,000 pounds. Many engine stands would buckle under this weight especially considering the overall length of the engine is more than 30-inches. To lighten the initial load (and protect from damage) I removed all of the items that I could including the carburetor, intake/exhaust manifold, starter, generator, fuel pump, rocker arm assembly, distributor and coil. With all of these parts removed I estimated that my engine with clutch & bell housing assembly still attached would weigh around 850-pounds. It would remain a beast but easily within the capability of my 2-ton engine hoist. I also decided to make an engine dolly/cradle out of 4X4 lumber and steel wheels. With my engine stripped down and dolly ready, it was time to call in my most loyal helper; my dad. Together we developed a plan of attack and began by attaching the engine hoist chains to the engine. We used four bolts and a load leveler. 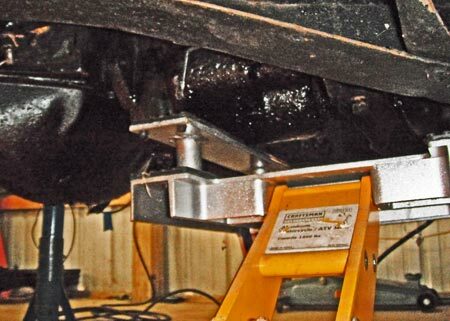 The load leveler would allow us to shift the weight of the engine during removal ensuring the ability to keep the engine level and safe until it was on the dolly. Load leveler in place with chains drawn tight. Once the slack in the engine hoist chains was out it was time to remove the bolts that attach the engine's bell housing and transmission. While the transmission is supported by a frame cross member I still placed a motorcycle jack under the transmission for additional support. I wanted to keep everything in line so, in theory, the engine and transmission would separate easily. 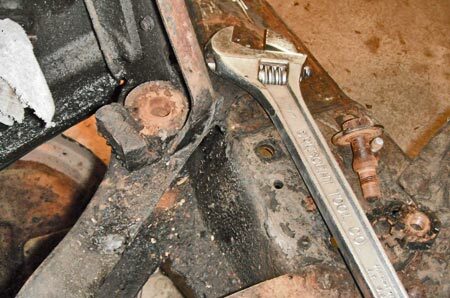 Once the six transmission-to-engine bolts were removed it was time to start loosening the actual engine mounts. 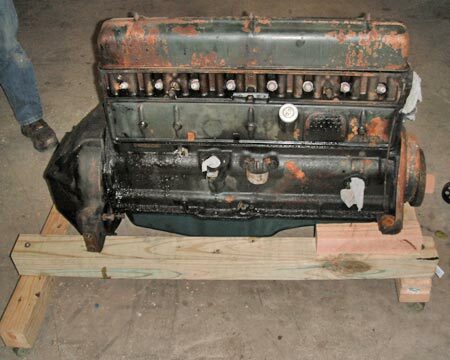 The Series 40 engine has a total of four mounts — two in the front that simply rest on reinforced portions of the frame and then two mounts in the rear that are wedged two-piece units made of steel covered with vulcanized rubber. Four bolts on each side hold the rear mounts while a single bolt attaches the front mounts. Motorcycle jack used to support the transmission. 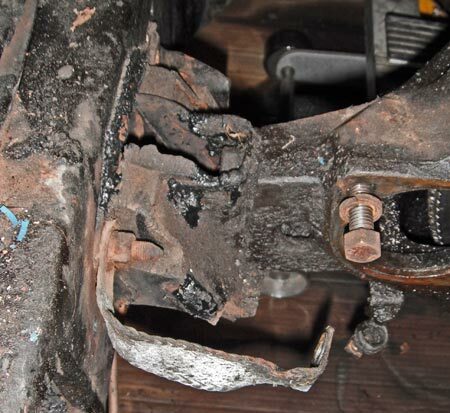 Front engine mount with bolt removed. The rear engine mount. It is a two-piece wedge and will be replaced with a new unit. My dad posing with our prize. 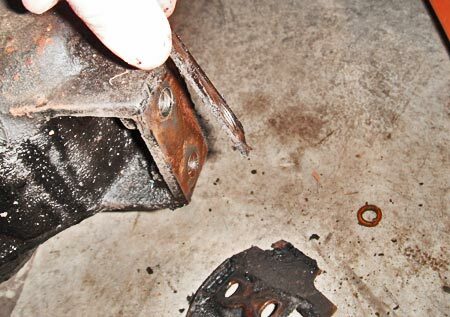 These are the four bolts that hold the rear engine brackets to the frame. Making note of the rear mount shim. 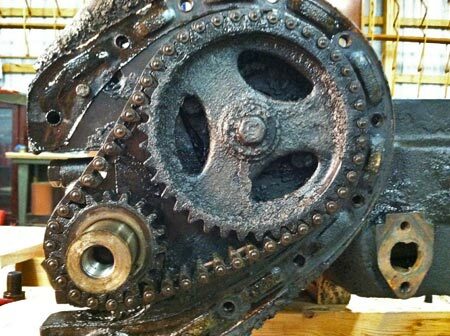 Crank & cam sprockets with timing chain. Think that needs to be cleaned?? The last time the car was without an engine was April, 1937. When a little more tension was applied to the engine hoist chains I removed all of the bolts and lifted the engine about an inch off of the frame. With me on the hoist and my dad handling a pry bar the engine began to slide forward! I was surprised how easy the beast slid forward and within a few short minutes of balancing and prying we had the engine completely free from the frame. Being the worrywart that I am, we snapped a few pictures, made note of the location of some mounting shims and then quickly lowered the engine on to the dolly. 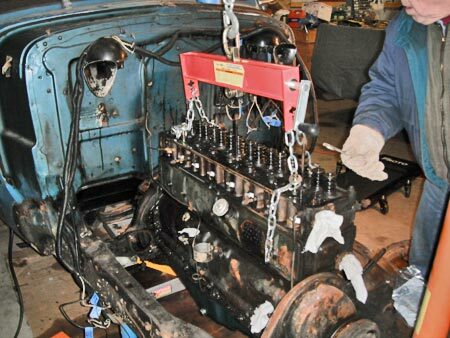 With the engine removed, my grand plan was to move it to a corner in the garage and come back to it in a few months. That approach turned out to be a lot like giving a child a bag full of candy in July and telling him to wait until Halloween to eat it. So, four days after removing it, I opened the engine to see if there were any major problems I should prepare for. I started by removing the cylinder head. With that removed I could get a clear view of the cylinder walls and inspect for major damage. There are twenty cylinder head bolts and two nuts. 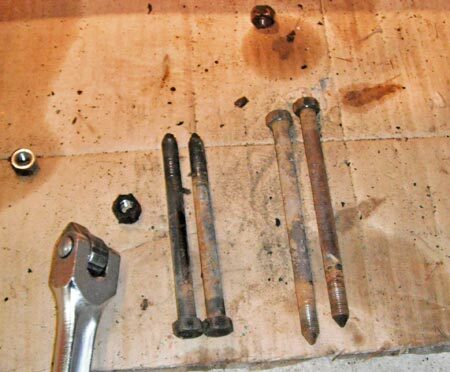 The nuts attach to studs that remain in the engine block and head removal with these studs in place requires you to lift the head perfectly straight or it will bind and prevent it from sliding. Like everything on this engine, the head itself is also very heavy, so I used a series of shims to raise it enough before I could lift it right off without a problem. With the head off I looked into the cylinders and foundâ€¦no damage! A quick glance at the valves revealed no major damage either. First glimpse into the cylinders. Aside from that gasket crud there were no major issues visible. From here I figured it wouldn't hurt to pull out the freeze plugs to see if there was any crud built up inside the block. I went looking for crud and found the mother lode. I was shocked by the amount of dirt and grime packed around the 7th and 8th cylinders. Since the temperature probe is at the back of the engine and I had never had any high-temperature indications I have to wonder about the accuracy of my probe or just assume the cylinders were getting enough coolant. Either way, using safety wire, screwdrivers and whatever else could get into the plug holes I spent a long time cleaning the block. I wasn't planning on getting it really clean it was more of a fascination of what I was pulling out and what I could find. A feeble attempt with the garden hose to flush everything out made me realize this block would have to make a trip to the hot-tank at the local engine shop. 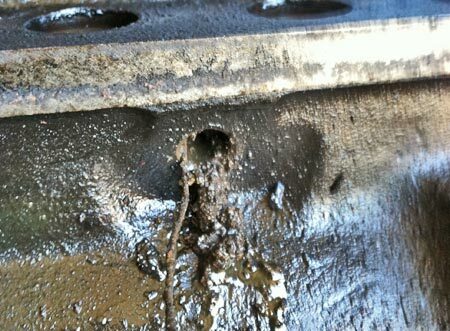 Crud sampling from rear freeze plug hole. Front freeze plug hole is clean. 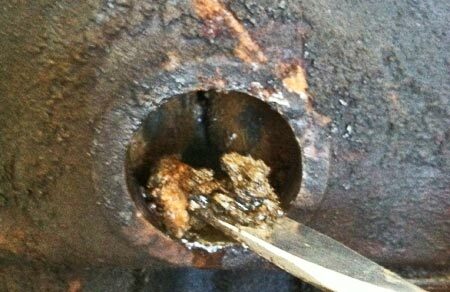 I removed the block drain and used safety wire to clear the blockage. After removing the oil pan it was time to remove the clutch, flywheel and housing. 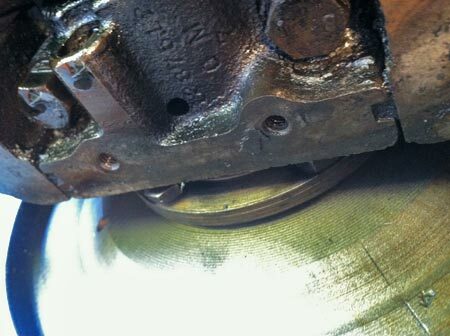 The clutch and pressure plates removed easily enough but the rest was tricky. The Shop Manual states that there are four bolts and two locating dowels that secure the housing to the block. In this situation, the Shop Manual is WRONG! 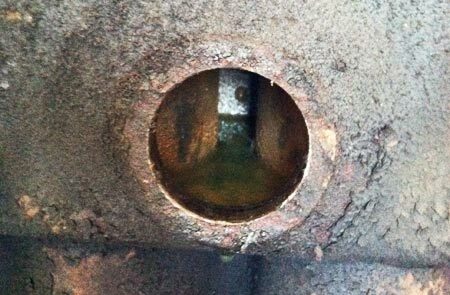 There are two additional bolts on the inside of the housing that can only be accessed if the flywheel is removed. The bolts that secure the flywheel are inserted from the engine side of the crankshaft toward the rear. 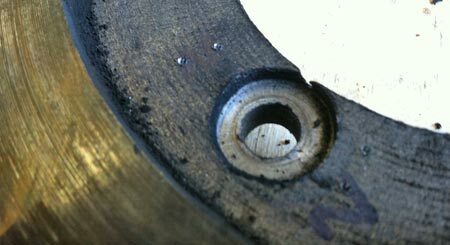 To remove these bolts you must first remove the rear crankshaft bearing cap then rotate the flywheel so the bolts can be pulled forward. Before complete disassembly I marked the flywheel and crankshaft at two different spots so I can be certain that they will go back together in the same position that I removed them. A look at the rear main bearing cap. Note that the cap prevents the flywheel bolts from backing out. Once the cap is off it is easy to pull the flywheel bolts out. With the flywheel out you can gain access to the final two housing bolts. 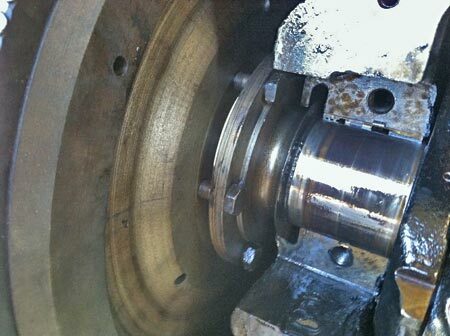 I stamped my crankshaft and flywheel so they would go back together the same way they came apart. 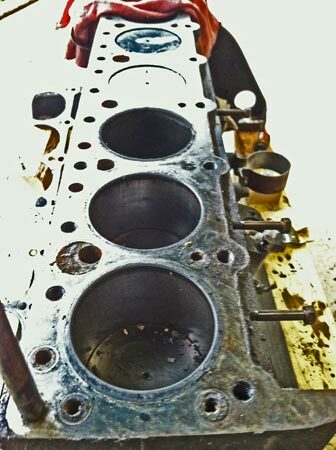 With my engine in pieces and only the valves, crankshaft, rods and pistons in place I was ready to do the real hard part of my engine assessment and that would involve some patience, Plastigage and detailed notes. I quickly learned that my initial plan to do a simple ring job wasn't going to happen and that it was time to go all in. Homemade engine dolly/cradle with wheels.